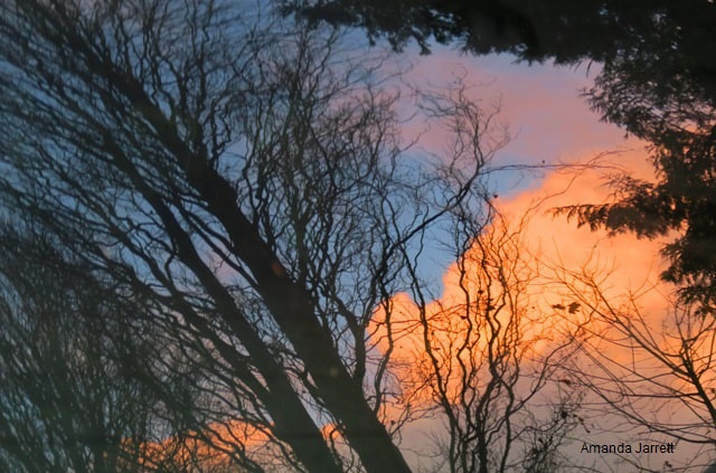 The reflection of a beech tree during a November sunset. 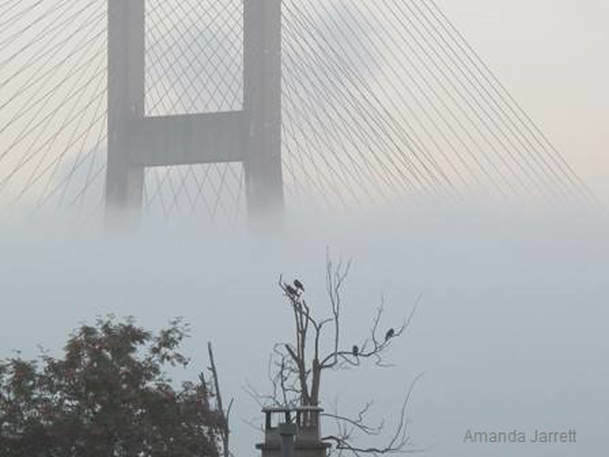 November brings rain, snow and thick fog in coastal Southern British Columbia. Weather gets serious in southern coastal British Columbia as November is one of Vancouver’s coldest months. Our first serious frost usually occurs this month, which is pretty good compared to the rest of the country. November is also the wettest month, with an average of 200 cm; that’s nearly 8 inches in 21 days out of 30. I’d break out a brolly, but winds can often make holding an umbrella a challenging albeit a humorous experience, especially for those watching. But that is the least of our problems if temps dip below zero, then that rain turns to snow. Heavy wet snow, no matter how beautiful it looks, breaks branches, squashes shrubs and downs weakens trees. Speaking of rain and snow, I hope to finish my garden chores before winter beats me to it. It is now a priority as time is-a-wastin’. I will be following my monthly list of the garden chores for November. Just because I write it, doesn’t mean I manage to get everything done - tsk, tsk. 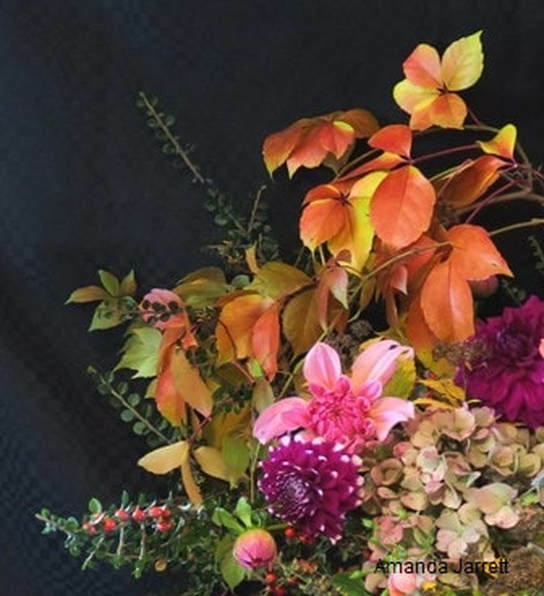 This November floral arrangement includes the colourful leaves of the Troki Virginia creeper, maroon pompon 'Jill' dahlia, purple & white 'Mystery Day' dahlia, 'Lucky Number 7' pink dahlia, red berries of the rockspray cotoneaster (C. horizontalis), & dusty pink mop head hydrangea (H. macrophylla). 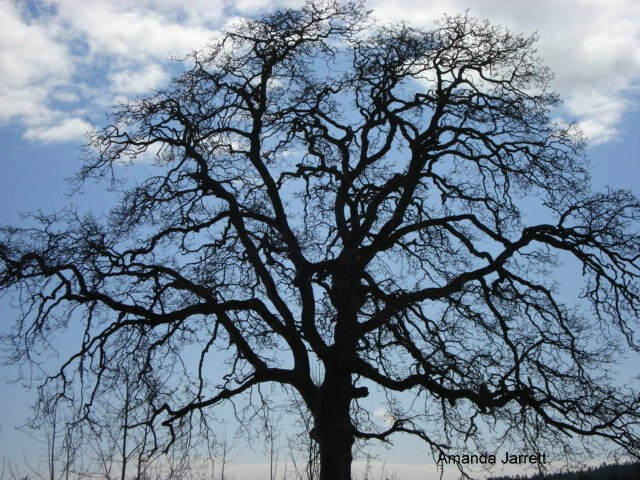 The elegant and intricate 'bones' of stately Garry oak, Quercus garryana. 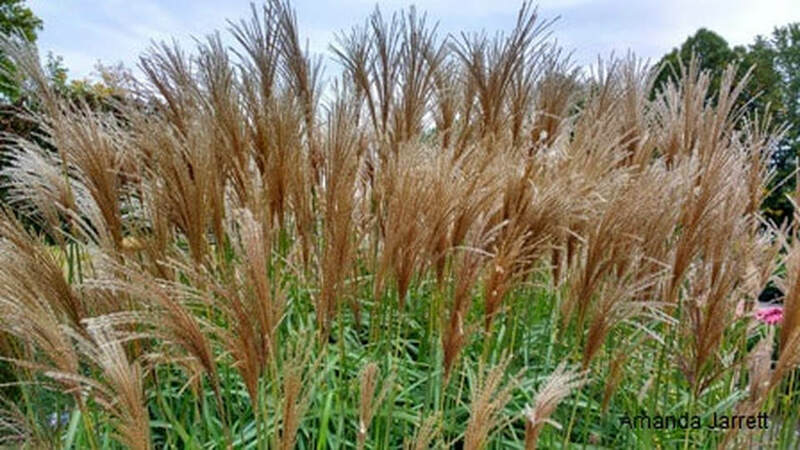 Sirene Silver Grass, Miscanthus sinensis 'Sirene', a warm season 4 to 5 ft plant, flowers grow to 6 ft. Prefers dry, well drained soil. Tolerant to heat, humidity, drought. Zones 5 to 9. 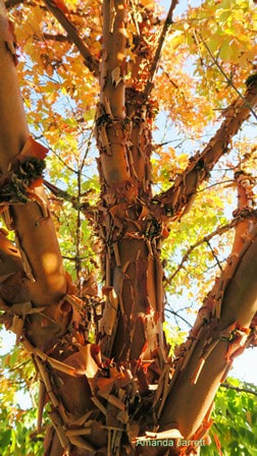 Paperbark maple, Acer griseum, deciduous tree, cinnamon red peeling bark, autumn colour, 20-30ft x 12-20ft. Sun, part shade, soil tolerant, prefers moist. Zones 4 to 8. For more info, go to Plant of the Month page or click on photo. 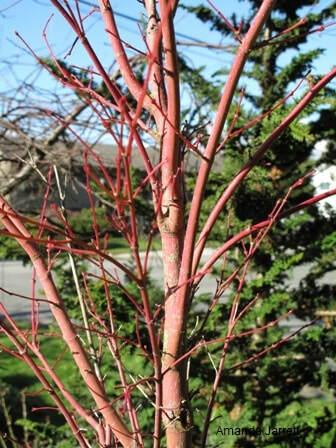 Coral Bark Japanese maple, Acer palmatum 'Sango Kaku', Zones 5 to 8, 15 to 25 ft. x 15 to 20 ft. wide. Deciduous tree, full sun, part shade, moist soil, dislikes extreme heat. Coral-red bark on young branches, autumn colour. Broadleaf evergreen shrub, Aucuba, Aucuba japonica 'Variegata', 4 to 6ft tall and wide, partial shade to shade. Zones 6 to 9. Prized for its green and yellow foliage. 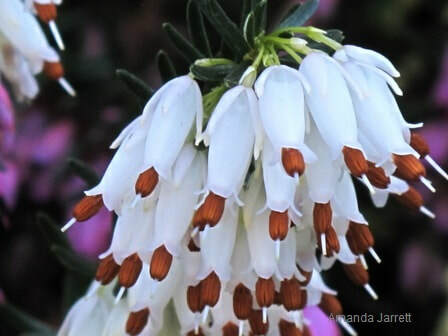 Winter heather or heath, Erica carnea, Zones 5 to 9, low spreading evergreen shrub, 1ft x 2ft, flowers throughout winter. Moist, acidic well drained soils, full sun part shade. Zones 4 to 9. 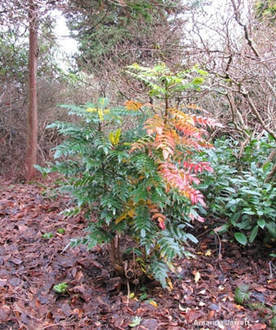 Oregon grape holly, Mahonia aquifolium, broadleaf evergreen, 3-6 ft x 2 ft, yellow spring flowers, red fall foliage. Soil tolerant, sun, part shade. 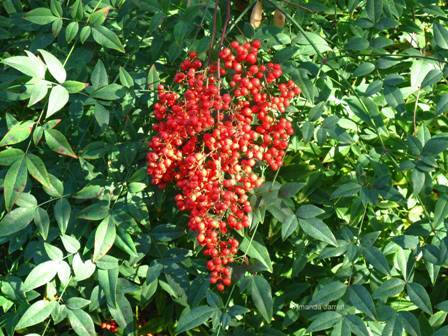 Heavenly bamboo, Nandina domestica, broadleaf evergreen, 3-8ft x 2-4ft, white flowers summer, red berries, sun, part shade, Zones 6 to 9. Japanese stewartia, Stewartia pseudocamellia, deciduous tree 20-40ft x 10-25ft. Zone 5 to 8, full sun, part shade, moist rich soils. 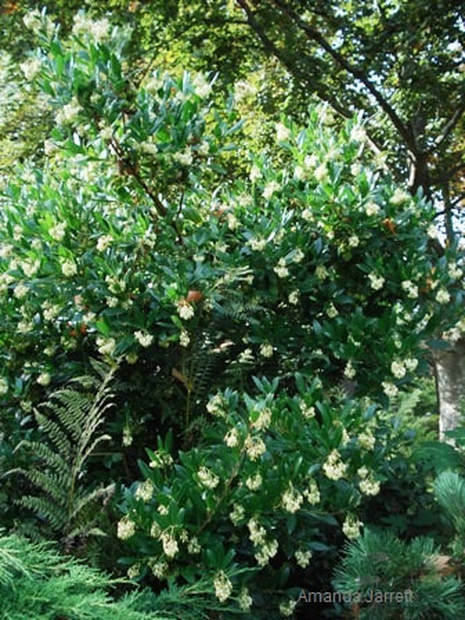 White camellia like flowers, attractive exfoliating bark, autumn colour. For more info, go to Plant of the Month page or click picture. 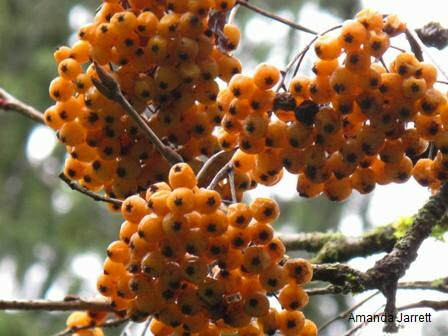 Mountain ash, Sorbus aucuparia, deciduous tree, 20 to 40ft x 10 to 20ft, spring flowers, berry clusters in fall colour depend on cultivar ('Joseph Rock'pictured). Sun, dislikes drought, Zones 5 to 6. The shiny oval leaves of the Bishop's Hat (Epimedium) pairs well with the frilly fronds of the Brilliance Autumn fern, Dryopteris erythrosora 'Brilliance'. 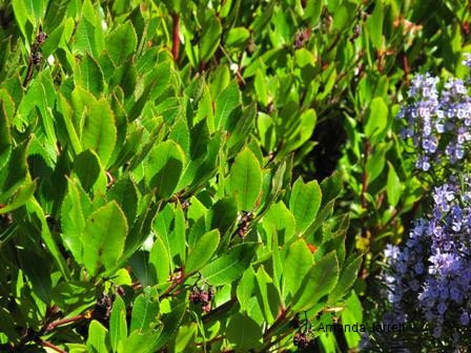 This evergreen duo prefers a shady location and moist, rich soil. There are numerous ways to deal with saturated soils, depending on why the soils don't drain properly. ​Soggy spongy lawns, liquefied soil and unexplained ponds popping up in the garden means trouble. You have bad drainage – nothing personal. First thing to do is figure out what the problem is. Foot traffic, walking on wet soil, parking and any heavy objects will compact the soil. 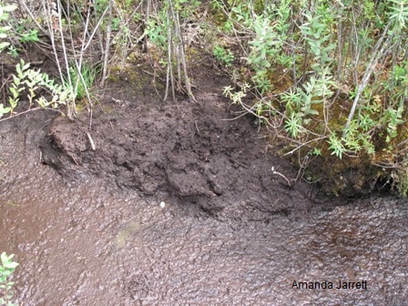 Squished soil prevents water from moving through it resulting in puddles and flooding. Low spots also collect extra water, but should drain in a day at most. Filling in the depression with soil is a good way to prevent puddling. For serious low spots that don’t drain convert the area to a pond, bog garden or even a rain garden. ​Add a few attractive plants that don’t mind wet feet and some will help dry things out: goat’s beard (Aruncus dioicus), Astilbe, water avens (Geum rivale), Gunnera spp., Japanese iris (Iris ensata), Siberian iris (Iris sibirica), Ligularia spp., Rodgersia sp., redtwig dogwood (Cornus sericea), river birch (Betula nigra), swamp maple (Acer rubrum), Persian ironwood (Carpinus persica) and willow (Salix spp.). To improve the water holding capacity of your soil, add organic matter (plant residue: compost, leaves, well-rotted manure etc.). It acts like a sponge absorbing excess moisture. Mix it in well and then add a 3 inch layer of an organic mulch over top of the soil. The mulch protects the soil and reduces erosion. Another option, is to install a trench (French drain) to move the water away. It is simple but very effective, permanent solution. This low tech method removes water from an area by using a trench and gravity. For more info on French drains click here. Avoid Sand: Although sandy soils drain easily, adding a layer of sand on top of the soil acts as a barrier. If you wish to add sand, mix it in well. Avoid adding sand to clay soils as the combination creates concrete. Soil Building & Health, click here. Some plants prefer wet feet like this Ligularia. It's shade tolerant too. 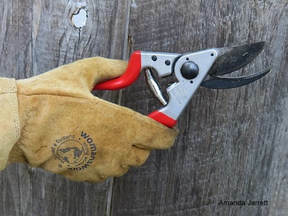 Disinfect pruning tools with a lysol spray solution, then spray with veggie oil and store in a dry location. Bring inside any leather gloves, holsters etc., so they don't get mouldy. ​It’s too late to do remedial pruning except for overly long rose and raspberry canes. Cut back rose canes to prevent them from wind rock (uprooting of plants due to the wind tugging on the long stems). Once raspberry canes have produced fruit, remove them at their base. 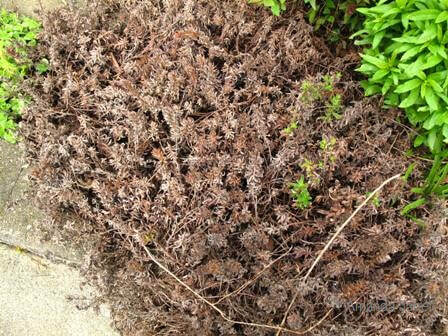 Check other garden plants and remove overly long stems that may break with heavy snow, ones in the way of pedestrians, broken branches, dead and diseased ones. Other than that, put your pruning gear away. Don’t forget to clean them first. I use Lysol or Pinesol diluted with water in a spray bottle to clean all my tools, especially my hand pruners, loppers and pruning saw. Use a paper towel to remove any residue then spray with vegetable oil spray such as Pam. 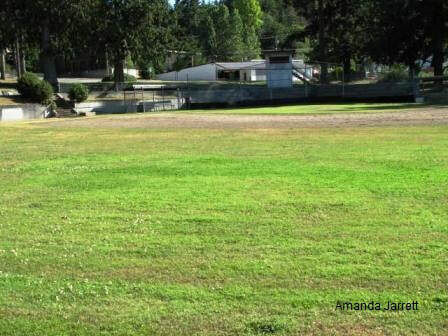 If your grass is still growing and needs a good haircut, don't cut it too short, like this scalped lawn. This lawn has been cut too short, which reduces root growth therefore weakening grass plants. For your last cut before winter, set your mower's height at 2.5 to 3 inches. And no nitrogen. It's too late in the season. Set the mower on the highest setting and mow the leaves as they lay on the lawn. Bag them as you go and place leaves on garden beds or compost them. Rake or mow fallen foliage from the lawn before it becomes frozen and covered with snow. Rake the leaves onto garden beds or bag them while mowing. Use the bagged shredded leaves as a nutritious mulch on garden beds. If you haven’t already done so, apply a winterizer fertilizer that is low in nitrogen (the first number) and high in the last number – potash. Potash promotes winter hardiness and root growth. Apply Dolopril lime if you didn't do so last spring. Fix up sparse lawns and patches by reseeding with a combination grass seed, fertilizer and mulch. For the last cut of the season, set the mower to 2.5 to 3 inches, preferably when the grass is dry (good luck with that one!). 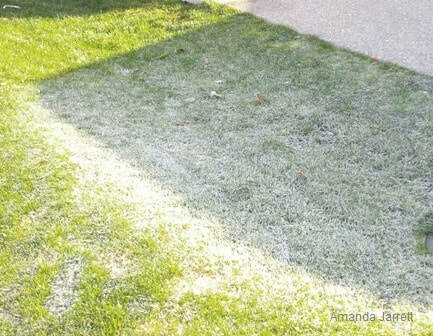 Frost on the lawn? Don’t walk on it as it crushes and breaks their crown, where the stems meet the roots, therefore killing the wee grass plants. No parking on it either. Before putting the lawn mower to bed for the season, clean it and sharpen it before storing it in a dry location. Drain the gas from gasoline powered mowers. Keep off frozen lawns, that includes mowing and foot traffic. This Lithodora is hardiness zone range is Zone 6 to 9. Although it was planted in Zone 8, it still suffered from winterkill after a nasty winter. British Columbia is a large province with varying weather with growing Zones of 2 up north to Zone 8 on the south coast. Wherever you live in Canada and beyond, know your hardiness zone so you can select hardy plants and protect those that aren’t so tough. Conditions also play a factor in plant hardiness. Dry soil, soggy soil, exposed areas, windy areas, high elevations, low spots all influence how a plant survives winter. Most plants in BC’s Zone 8 don’t need protection, but there are exceptions: pineapple lily (Eucomis autumnalis), freesias, fuchsias, elephant ears (Colocasia spp. ), New Zealand flax (Phormium spp. 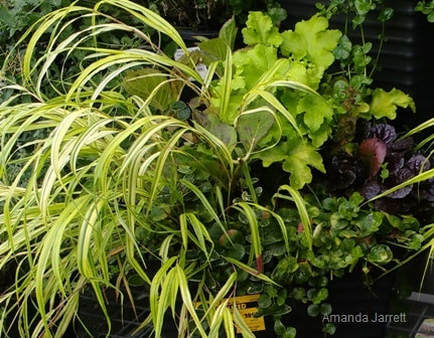 ), hardy bananas, tender succulents, Chinese windmill palms, cannas and any newly planted plants. To protect plants roots and crowns, cover their base with about 6 inches of soil, leaves or mulch. To protect the above ground portion of plants, wrap with layers of burlap, sheets, tablecloths, rugs, and cardboard. Don't use plastic, as it has no insulating. Cage bananas, palms and tree ferns with chicken wire and fill with foliage or mulch. Tie pyramidal, round and upright evergreens such as cedars with twine to prevent heavy wet snow from destroying their shapes. To protect palm trees, wrap the top with fabric and nestle a string of 7 volt, non LED outdoor lights, such as Christmas lights, in the growing bud of (where the fronds emerge at the top of the plant). Turn on the lights when temperatures go to below freezing. Tie pyramidal and globe cedars as well as other evergreens with string so snow doesn’t break their branches and distort their growth. A banana plant is nestled snuggly under a cage of fallen leaves. 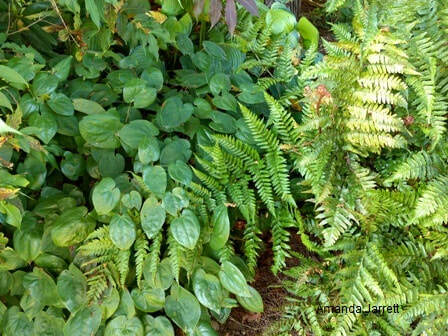 Japanese forest grass, coral bells, creeping Jenny and bugle weed are all evergreen perennials that like partial shade. Place any planted containers in a protected location preferably close to the house and under the eaves. Remove any drainage trays left over from the summer to prevent sodden soil. Check on planters under the eaves to make sure they don't dry out. To protect plants in containers over the winter, wrap the pots, but only the pots, with a layer of bubble wrap, fiberglass or Styrofoam sheets. An alternative is to sink the pots into the ground. Avoid leaving empty clay and ceramic pots outside as they often crack and may even shatter with the fluctuating and freezing temperatures. 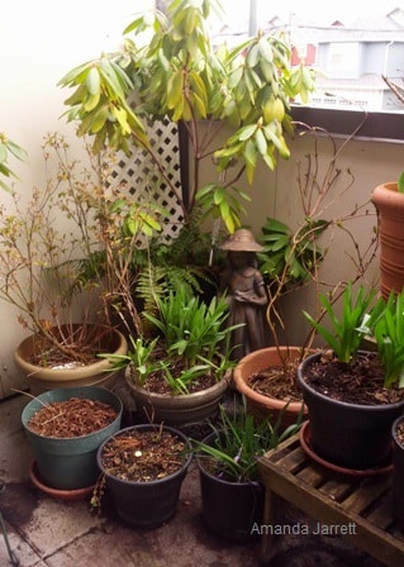 Instead of retiring planted containers for the winter, just add interesting twigs and cedar, pine or fir boughs. Throw in some daffodils and other spring flowering bulbs, primroses, winter pansies, wall flowers (Erysimum sp.). 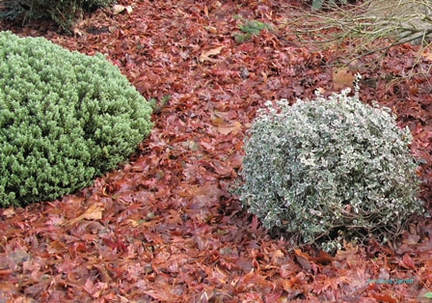 Add hardy broadleaf evergreens: skimmia, sweet box (Sarcococca sp.) and heather (Erica carnea). For more on growing in containers click here. To learn about the different types of containers click here. My Mother's planters full of spring bulbs are nestled together for protection. Plant garlic cloves now and reap the rewards next spring or summer. Click on any green or red items below to be redirected to a relevant page for more information. 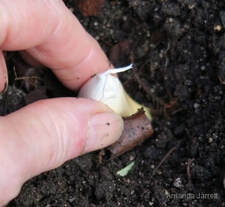 Plant Garlic: Separate the individual cloves and plant in a sunny location with good drainage. Plant Spring Bulbs: There's still time to plant some tulips, daffodils and other spring flowering bulbs. Summer Bulbs: Dig up and store any tender summer bulbs such as dahlias, tuberous begonias, gladiolus and cannas. Let them dry to cure in a cool, frost free dry place. Store in cardboard boxes filled with vermiculite, peat moss etc., in a cool frost free area away from light. Transplant & Plant: If it’s not too wet and the ground isn’t frozen there’s still time to transplant and plant trees, shrubs and perennials. 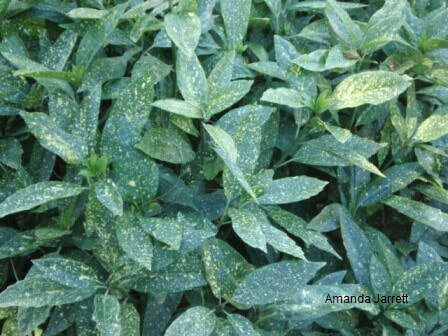 Select a fair weather day as rain spreads disease and compacts soil, especially this time of year. Prune: Overly long rose canes and remove raspberry canes that have borne fruit. Prune: Dead, diseased branches from trees before winter prunes them for you. Winterize Planters: Protect the roots of plants growing in planters by wrapping the container with bubble wrap. Protect them even further by grouping numerous containers together against the house and under the eaves. Adorn Planters: Fill containers with hardy plants, evergreen boughs, and branches with berries. Include tulips and other spring flowering bulbs. Protect tender plants: Wrap with old tablecloths and bed sheets, cover crowns with soil or fallen leaves. Make New Beds: Install new beds, weather permitting and when soil doesn't drip when squeezed. Either remove the sod or do the lasagna (sheet mulching) gardening method. Edge Garden Beds: It's a good time to edge new and old garden beds to reduce maintenance. Edging prevents grass from growing into the beds and makes line trimming easier. It looks neater too. Clean Garden Beds: Remove diseased, infested and infected plants and plant parts from the ground. It’s best not to remove everything on top of the soil and it is unnecessary and harmful to cut back all the plants. 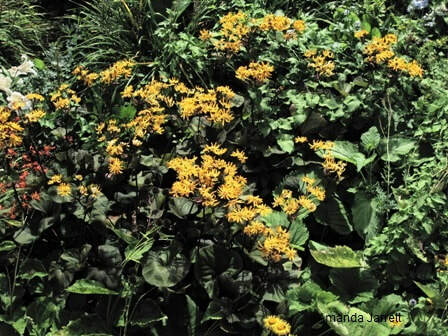 Cut back perennials, but leave a few inches above the ground. Add a 3 inch layer of mulch on top of the soil and around plants. Stop caterpillars with tree banding. 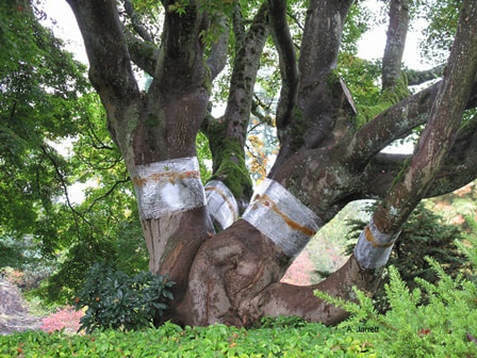 Purchase a tree banding kit or wrap plastic wrap around tree trunks, smear the plastic with Tanglefoot to prevent caterpillars from climbing and infesting susceptible trees. For more info click on the photo to be redirected to Controlling Plant Pests. 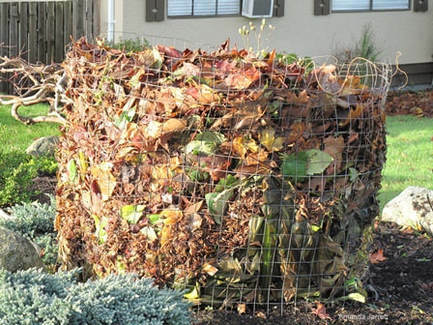 ​Compost: Give your compost one last turn before winter sets in and add water if necessary. 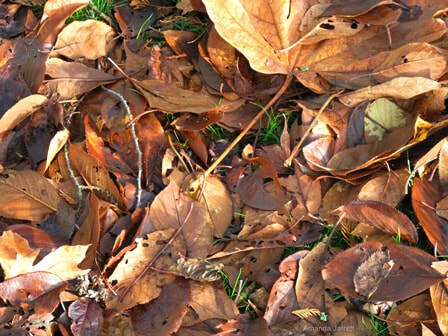 If it is too wet, add dried fallen leaves or torn up newspapers. Tempting as it may be, refrain from adding seedy weeds and buggy plants. No Nitrogen Fertilizers: Don’t apply high nitrogen (the first number on fertilizer labels) fertilizer at this time of year. Nitrogen stimulates new, lush growth, which is vulnerable to frost damage. If plants and turf are looking yellow, feed with a high potassium winterizer fertilizer (the last number is the highest). Harvest: Harvest any remaining veggies except for ones that don’t mind a touch of frost: brussel sprouts, cabbage, carrots, parsnip, kale, broccoli and chard. 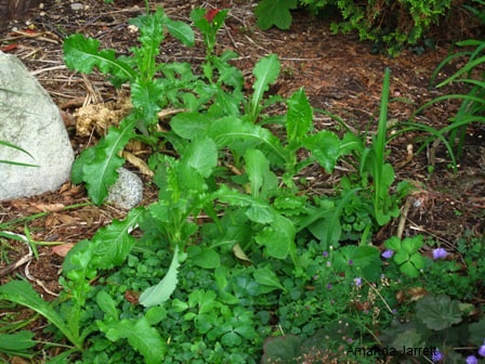 Weed: This is a good time of the year to tackle any weeds as soil is moist and plants aren't so vigorous. This is a good time of the year to tackle any weeds as soil is moist and plants aren't so vigorous. Prevent Flooding. Remove fall leaves and other debris from gutters and any drains in and around your property. Irrigation: Blow out and drain irrigation systems, turn off the source to outside faucets and drain garden hoses. Bare Beds: Harvested veggie beds and other bare beds need to be covered through the winter due to erosion, temperature fluctuations, winter weeds and nutrient leaching. Add a 3 inch layer of straw or fallen fall leaves over the soil surface. A thick layer of shredded newspapers also works. Shed: Remove all fertilizers, dormant oil/lime sulfur and other garden products and store in a frost free location. Garden Tools: Clean and sharpen garden tools. Patio Furniture: Put patio furniture away after wiping them down. 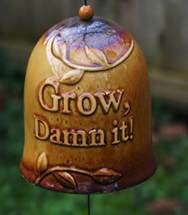 ​Garden Journal: Take notes and pictures of your successes and failures if you haven't already done so. Include a map of the veggie garden so you can rotate crops next year. Fallen autumn foliage is nature's most nutritious mulch and it's free for the taking. Rake or mow it off the lawn and place on top of soil and around plants. Make the mulch thick so it doesn't blow away. 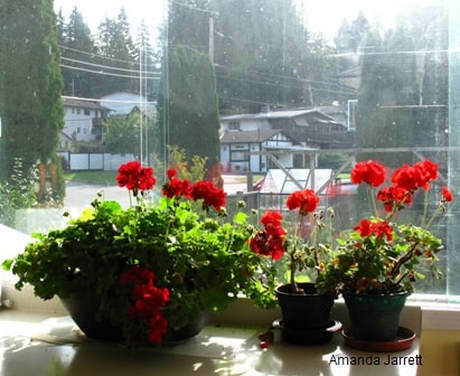 Move houseplants and overwintering annuals, like these geraniums, in front of a sunny window or under a grow light. Houseplants might be looking a bit pale and less vigorous now as the sunlight moves to the Southern hemisphere. Plants respond to the reduced daylight hours and weaker sun by looking rather sad, poor things. Move any suffering houseplant to a sunnier window, if you have one, if not use grow lights or fluorescents. Even plants in a south facing window benefit from extra lighting. Keep the lights for 8 to 12 hours. I use a timer for convenience. Since plants are slowing down, don’t keep your summer water schedule. Check the soil with your finger before watering and allow soil to dry slightly before watering. Sickly houseplants may not just be suffering from lack of light, insects could also be responsible. 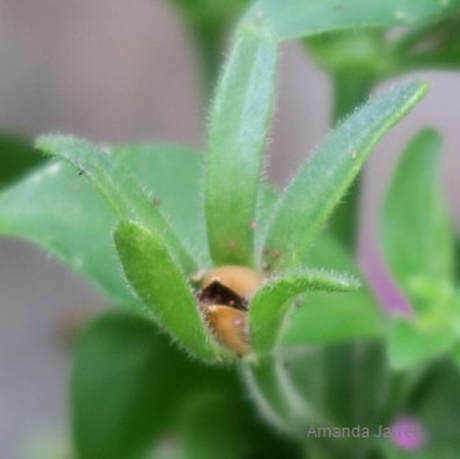 Check under the leaves, stems and everywhere for bugs. Be diligent with your inspections of all houseplants but especially those that were vacationing outside during the summer: bougainvillea, oleanders, hibiscus and geraniums. ​If you do see insects, sponge the plant down with a mild dishwashing liquid and lukewarm water. For small plants, just dip them upside down with your hand straddling the top of the pot. Keep them submerged for a few seconds then upright them and give them a light rinse. Another alternative, especially for big plants, is to squeeze a soapy sponge all over the plant. To kill any subsequent generations of insects, repeat every 7 to 10 days. 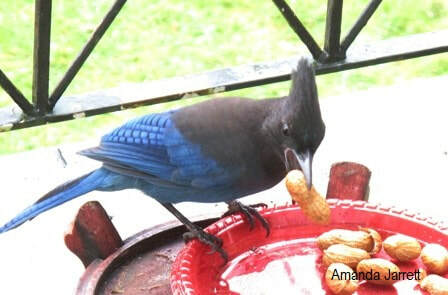 Bird feeding stations are essential for the survival of overwintering birds. Birds that hang around in the winter rely on the kindness and steady food. In the Pacific Northwest, that also includes hummingbirds. Keep hummingbird feeders filled as many stay in town in the Pacific Northwest. Don’t forget to wash before refilling. Before adding more bird seed to feeders, remove any remaining mouldy seeds and clean the feeder if necessary. Birds benefit from a nice seedy suet cake or a pine cone stuffed with mix of bird seed and peanut butter and hang them in the garden. Hardwood Cuttings: Take hardwood cuttings from deciduous shrubs and evergreens now through winter and early spring. Use dormant, mature stems with firm wood that doesn’t easily bend. Root Cuttings: Take root and basal cuttings now until mid-February from most perennials ex: Oriental poppy, mullen, phlox, quince. Collect Seeds: Finish collecting dry, mature seeds from the garden and store all your seeds in a frost free, dry location in paper envelopes, not plastic as it promotes rotting. Ensure they are dry before storing and label them. Inside this brown seed capsule are hundreds of tiny black petunia seeds. It's a good time to take hardwood cuttings from roses. 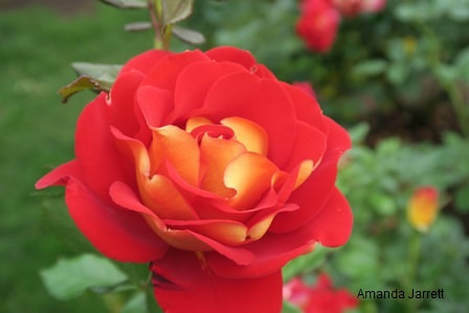 Here's 'Ketchup & Mustard', a floribunda rose from the Portland Rose Test Garden. Lovely! 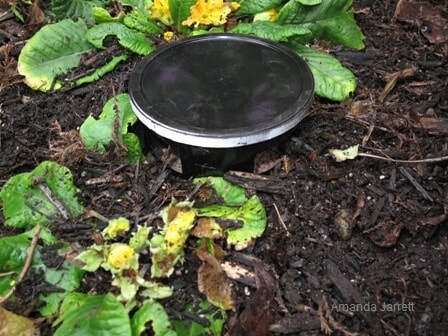 A homemade trap with slug bait inside is set at ground level to trap the slugs eating the surrounding primroses. Slimy trails are tell-tale signs that slugs and snails are on the prowl. As they devour the garden plant by plant, you can hunt them down and put an end to their feasting. Pick a rainy day or go out at night with a flashlight and a cup of salty water. They are easy to pick off as they come out of hiding to eat. If you are squeamish, trap them with slug bait, but use slug traps. The traps keep the bait dry and prevent animals from eating it. I make my own traps with a recycled plastic margarine container. Cut a few windows at the same height around the container, add the slug bait, put the lid on. Bury it in the ground so the bottom of the windows lines up with the soil surface. The slugs and snails will enter the container, eat the bait then die. This method keeps the bait dry and keeps animals including pets from ingesting the bait. 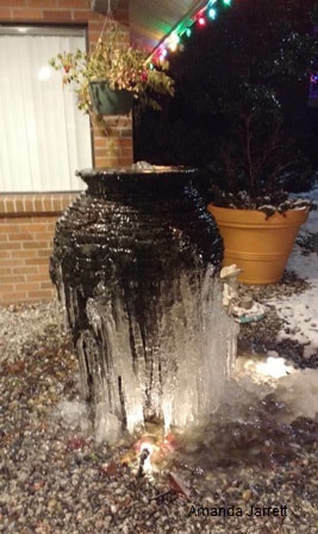 A fountain continues to flow despite the growing icicles. ​When all the planting is finished for the season, turn off the water supply to all outside faucets. This prevents water freezing in the pipes, and bursting in the walls. Blow out the lines of pumps from waterfalls and ponds then store them inside. Empty the water out of garden hoses and any spray heads and store for the winter. Underground irrigation systems should have their winter maintenance done before freezing temperatures arrive. Blowing out the lines every winter is part of routine maintenance. Rockspray cotoneaster berries, Swiss chard, Tuscan kale, red miniature rose, heavenly bamboo, Coral Flower Carpet rose, burning bush, chrysanthemum and Stewartia. 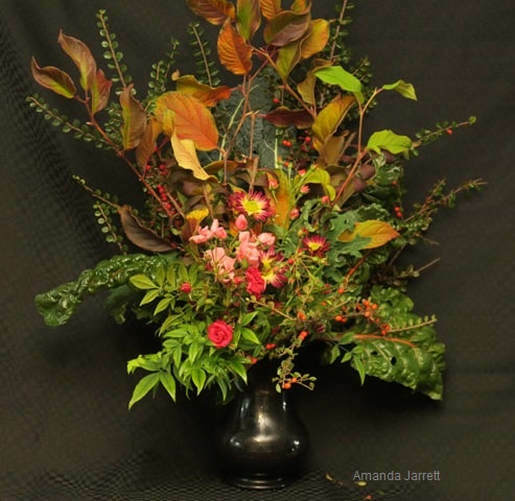 Click here for more floral arrangements. 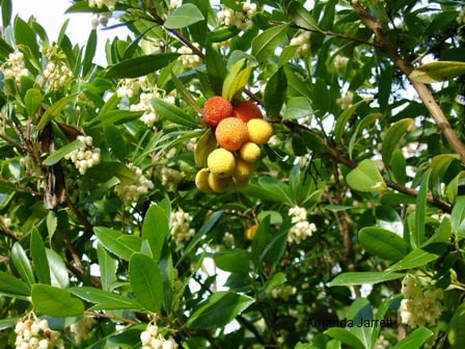 The Strawberry Tree bears colourful fruit and fragrant flowers at the same time. 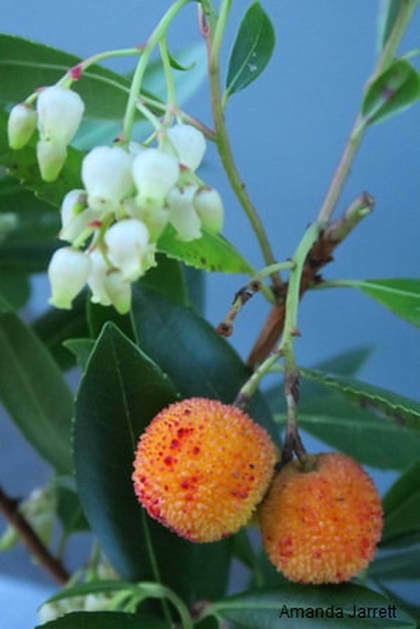 The dwarf Strawberry tree can also be grown as an attractive shrub. Fragrant flowers hang in drooping clusters in fall and into winter. The attractive strawberry looking fruit matures from green to yellow to red. Their colourful fruit and fragrant flowers. So pretty. 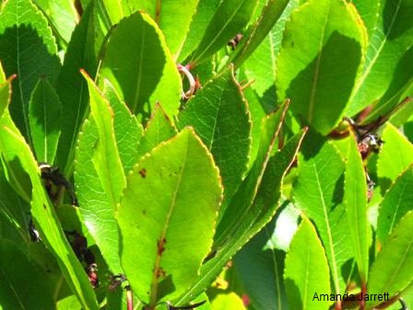 Arbutus bear thick, leathery evergreen serrated foliage. Comments: Known for its attractive bark, a nice round canopy that bears green, yellow and red strawberry-like fruit and all at the same time. Can be grown as a small tree or large shrub especially the dwarf varieties. Suitable for small urban gardens. 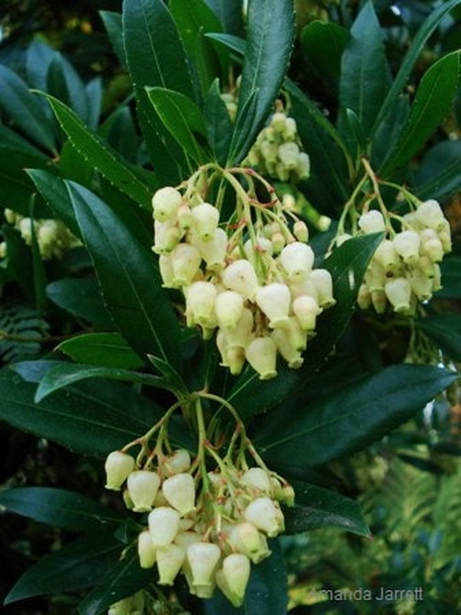 Arbutus grown in containers are not as hardy as those in the ground especially so winter protection is required. This drought tolerant, waterwise plant requires good drainage and is intolerant of soggy soil. 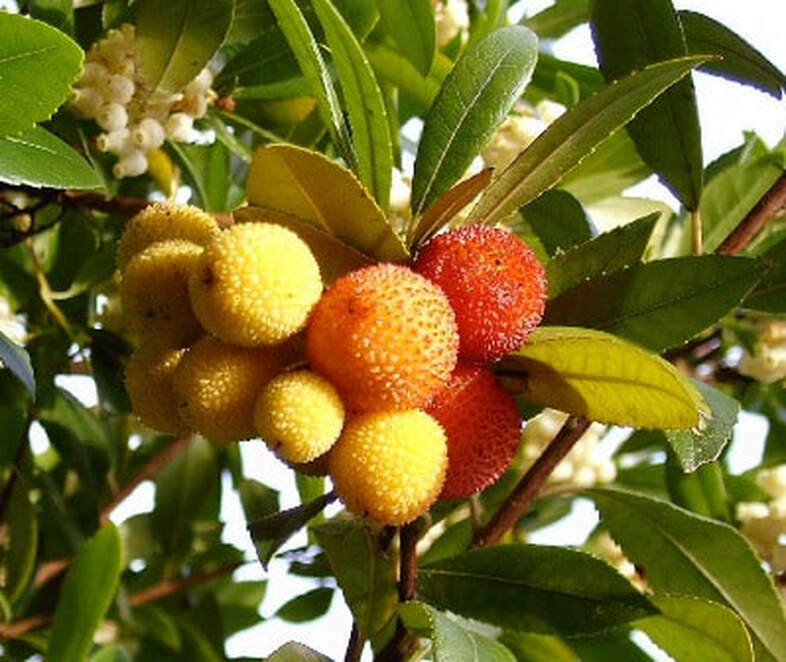 Although the fruit is edible, it tastes bland, which explains its botanical name. It’s a combination of unum meaning ‘one’ and ‘edo’, which translates to “I eat one”. A. unedo ‘Compacta’: dwarf cultivar that grows from 6 to 8 ft. tall to 5 to 6 ft. wide in 10 years. 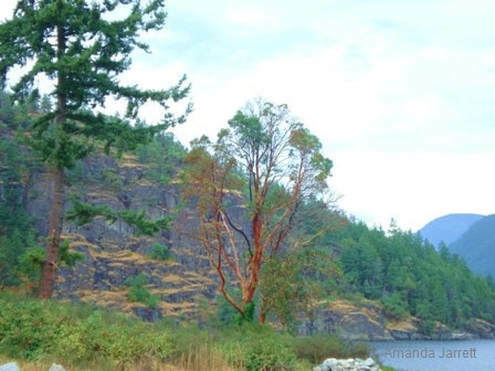 The Pacific Madrone, A. menziesii: (pictures below) An indigenous plant native to Vancouver Island and the Gulf Islands and adjacent coastal mainland. Grows in rocky outcrops where soil is free-draining, shallow and nutrient-poor. Multiple trunks with twisting branches form close to the ground and often leans. 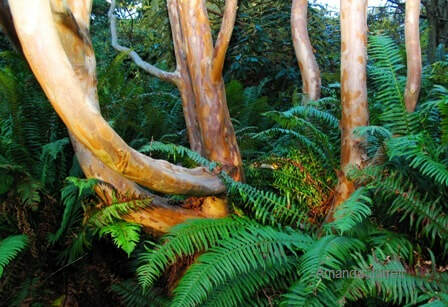 Pacific madrones have the potential to grow 100ft (30 metres). 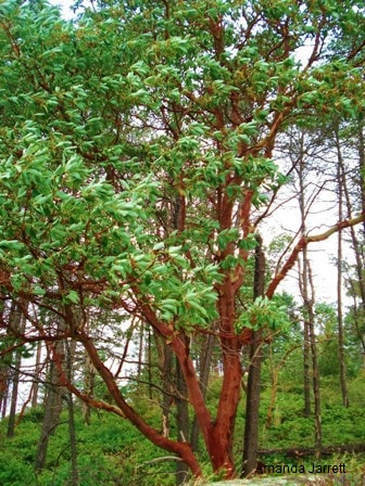 It’s Canada’s only broadleaf evergreen tree and it is protected by the city of Victoria and Saanich, BC. Because of its soil requirements as well as being protected, it is not recommended nor commonly available for home gardens. A. unedo ‘Compacta’, is much more adaptable, is not a protected species, is commonly available and is recommended for home gardens. 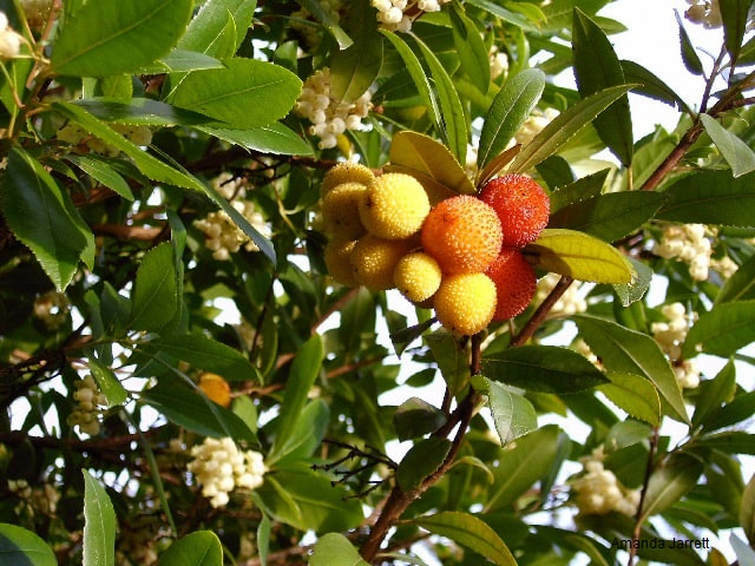 The strawberry tree is shrub-like and bears twisted branches and red stems. Their tough leaves are drought tolerant and prefer full sun. Indigenous to the rocky outcroppings of Vancouver Island and along the western coastline into California. 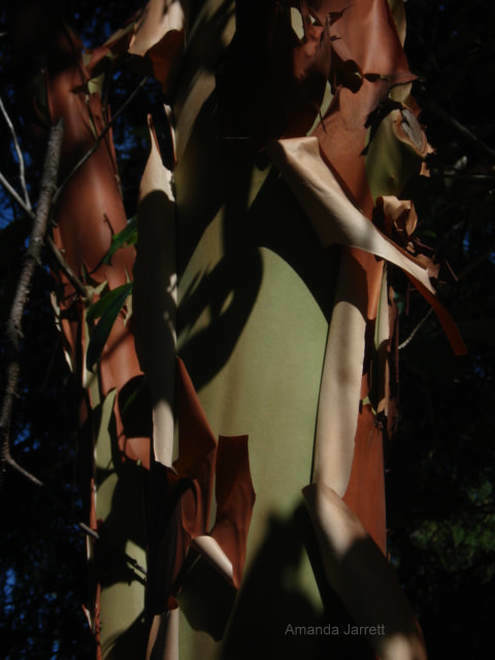 The red cinnamon bark dramatically flakes off revealing a smooth green bark underneath. Cinnamon coloured branches twist and turn giving the plant a rather tortured appearance. Attractive but tortured. 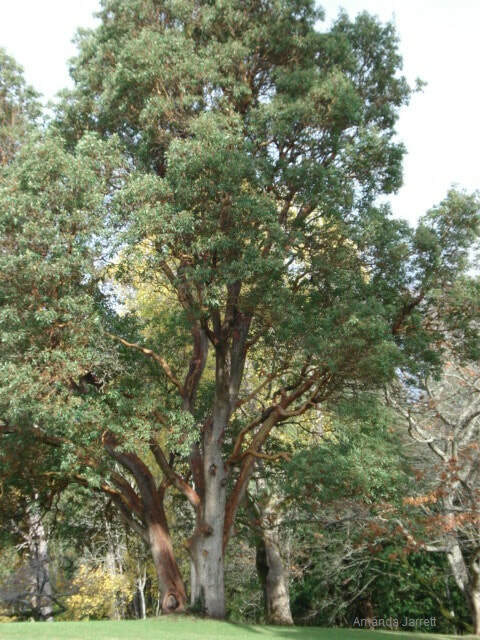 Mature Pacific madrones can grow to 100 ft. Need help figuring what to do in your garden? Make an appointment for Amanda to come to your garden to show you how to grow food, sow seeds, prune, design beds etc. Need help trying to figure out how to get the garden ready for spring? Get Amanda to teach you the ropes by making an appointment here. ​For landscapers looking for work and landscape companies looking to hire.